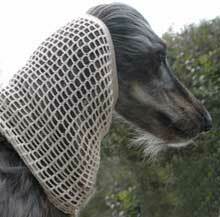 Snoods are essential for long coated hounds and help protect long ear fringes. Our dog snoods are handmade for a perfect fit. We have made dog snoods for all sorts of breeds: Afghan Hounds, Salukis, Spaniels, Shi Tzus, Spaniels and even a Pharaoh Hound (who had a major neck surgery)! We make both fabric and crochet snoods, which come in a wide range of colours and materials. Fabric snoods can be made in a wide range of matrials: cotton, fleece, elastic or reflective. Crochet snoods can be made from cotton, fancy or metallic yarns. These crochet snoods are proving extremely popular as they allow air to circulate around the ears. Crochet snoods can be made from cotton, fancy or metallic yarns. Please measure your dog as shown on the diagram. A to B measurement will give you neck size circumference, and A to C measurements is the length of neck. Please add a few centimetres if you prefer your snoods to be on the long side. Please don't hesitate to call +44 (0) 20 3582 4532 or e-mail us for any help with measuring or choosing the dog snood. If you can imagine it, we can make it! It takes time to make a good snood and on average there is a 2-week waiting time.